Ron Cauble in The Bone Room. Photo: Kaia Diringer. Ron Cauble passed away suddenly and unexpectedly on July 19th, 2014, at the age of 74. Born in Indiana, Ron excaped the Midewest to obtain his PhD in Chemistry at the University of Washington. As an Army captain, he worked for a time in Alabama, developing rocket propellants under Werhner Von Braun; in 1969 he transferred to the San Francisco Bay Area for a job at Livermore Labs. A few days after starting, he and a hundred other recent hires were laid off. 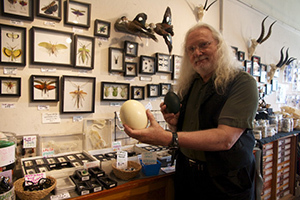 He next turned to his love of nature and animals, and started The East Bay Vivarium, a reptile emporium, in 1970. The Bone Room began in an anteroom of the EBV in 1985, and moved to its present location in Berkeley in 1993. In The Bone Room, Ron indulged his wide-ranging scientific interested in a retail arena, offering skulls, skeletons, insects and fossils to the public. Always the casual educator, he started The Bone Room Presents in 2010, a salon where he enjoyed hosting scientists and science writers for lectures and book signings, generally free to the public. What gave him joy throughout his life was studying the beauty and mechanics of both life and death, from the atoms and chemicals that compose the universe to the metaphysical complexities of the human condition. But philosophy and science and the wonder of the natural world cannot console those of us who will most feel the loss of his intelligence, charisma, and exuberance.